The engineer in charge of telecommunications during Curiosity's entry and descent into the Martian atmosphere is speaking from noon to 1 p.m. Nov. 2 at UC San Diego's new Structural and Materials Engineering building. Brian Schratz will give a first-hand account of what it was like to work in mission control the night Curiosity, also known as the Mars Science Laboratory, landed. He also will present an overview of the spacecraft's mission. At the Jet Propulsion Laboratory, Schratz is responsible for ensuring that Curiosity's hardware and software is designed correctly to transmit critical entry, descent and landing data in real time. He also coordinates communications with the three Mars orbiters, and NASA and European Space Agency tracking stations on Earth. Schartz joined the Jet Propulsion Laboratory full-time in 2009, after receiving his master's in electrical engineering from Penn State in 2008 and serving as a Fulbright fellow in Norway. He also was a fellow in NASA's graduate Student Research Program. As a student, he led and developed instruments used for several balloon, rocket and satellite projects. The event is sponsored by The California Space Grant Consortium, headquartered at the Jacobs School of Engineering at UC San Diego, and The Arthur C. Clarke Center for Human Imagination. For more information, email tlazzouni@ucsd.edu or call (858) 822-1597. Three legendary San Diego venture capitalists will discuss past lessons learned and thoughts about the future of local commercial biotech ventures during the first in a series of planned “conversations” Nov. 7 in Calit2’s Atkinson Hall at UC San Diego. The event is being billed as the first of its kind in San Diego. “What’s Past is Prologue: Creating the Life Sciences Industry in San Diego” is sponsored by the Life Sciences Foundation and the UC San Diego Library, and is co-sponsored by Connect and Sughrue, with community partners Biocom and San Diego Venture Group. The panelists, who will offer their insights into the past and future of San Diego biotech, will include Jim Blair of Domain Associates, Kevin Kinsella of Avalon Ventures, and Tim Wollaeger of Sanderling Partners. Ivor Royston of Forward Ventures will serve as moderator. The 4 p.m. discussion will be followed by a reception at 5 p.m.
Blair, Kinsella and Wollaeger helped to create the San Diego life sciences industry more than 30 years ago, and remain active today. Creating such high profile companies as Dura Pharmaceuticals, Vertex and Pyxis, they will discuss the birth of San Diego’s life sciences cluster, current conditions, and their vision for the future. Moderator Ivor Royston, M.D., is a founding managing partner of Forward Ventures. Dr. Royston has been involved in the biotechnology industry in San Diego from its inception in 1978 with the founding of Hybritech, Inc., later acquired by Eli Lilly, and with the founding of Idec Pharmaceuticals in 1986, which later merged with Biogen. Jim Blair has been a partner of Domain Associates since its founding in 1985. Dr. Blair has over 40 years’ experience with venture and emerging growth companies. He has been involved in the creation and successful development at the board level of over 40 life sciences ventures, including Amgen, Aurora Biosciences, Amylin Pharmaceuticals, Applied Biosystems, Dura Pharmaceuticals, GeneOhm Sciences, Molecular Dynamics, NuVasive, Pharmion and Volcano. Kevin Kinsella founded Avalon Ventures in 1983. He has specialized in the formation, financing and/or development of more than 100 early-stage companies. Kinsella was the founding chairman of Athena Neurosciences, Aurora Biosciences Corp., Landmark Graphics, NeoRx, Onyx Pharmaceuticals, Inc., Synaptics, Vertex Pharmaceuticals, X-Ceptor and Sequana Therapeutics. Timothy Wollaeger has more than 30 years’ experience in the medical products and biotechnology fields in both corporate management and venture capital. Wollaeger joined Sanderling Ventures as a managing director in 2002, and opened the firm’s San Diego office. He founded Amylin Pharmaceuticals, Biosite, Columbia Hospital, Digirad Pyxis, Senomix, Sotera Wireless and Vical. The Life Sciences Foundation is dedicated to capturing the history, preserving the heritage, and sharing the stories of biotechnology. The foundation collects and organizes historical information to educate and inspire future innovators, to engage the general public, and to provide lay audiences with an understanding of life sciences and biotechnology. Fifty UC San Diego computer science students took part in the Fall 2012 UCSD Programming Contest Saturday, Oct. 13. They were vying for cash prizes, including $1,000 for first-place. During a pizza-fueled five hours, contestants had to solve eight programming problems. Finally, Julaiti Alafate come out on top, by solving six of the eight. James Mouradian placed second, Deepak Arulkannan third, Josh Tobin fourth and Manoj Mardithaya fifth. The prizes, food and drink were provided by the Dini Group, a La Jolla-based hardware and software engineering firm specializing in high performance digital circuit design and application development. Graduate student coaches Whitney Maguffee, Mohammad Moghimi, Do-Kyum Kim and David Michon and Faculty Coach Michael Taylor, from the computer science department, ran the contest. More details and a list of the top 25 finishers can be found here. 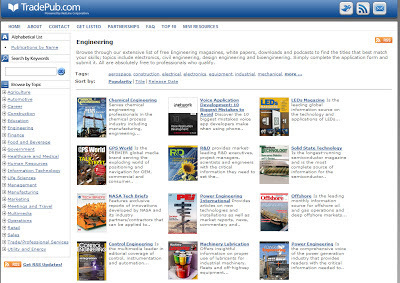 Here is a nice list of engineering trade publications on www.tradepub.com. I got this specific link from www.alltop.com on their engineering page. Jacobs School alumna and Olympian Christine Sonali Merrill was at UC San Diego today to sign autographs. Merrill, who earned a bacherlor's degree from the Jacobs School, represented her mother's native country, Sri Lanka, in the 400-meters hurdles at this year's London Olympics.Today, she graciously signed autographs and posed for pictures. Her appearance was part of the Onward California Mobile Tour, a statewide roadshow hosted by the University of California to build awareness of the impact the university has on our everyday lives. The tour celebrates noteworthy UC individuals and innovations and encourages passionate supporters to share why they believe in UC. Naia Bar Gelato, which has its roots at UC, served complimentary gelato with 10 flavors to choose from—one for each campus. UC San Diego’s flavor is green tea, in recognition of the campus' sustainability efforts. The interactive tour experience included a photo booth with UC props, an “I BELIEVE IN UC” art wall and a postcard station where guests can share their UC story. 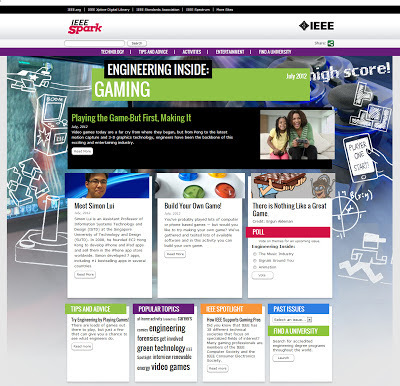 IEEE Spark is an online publication intended to inspire students ages 14-18 to learn more about engineering, technology, and computing, and raise excitement about careers in these disciplines. IEEE Spark features articles on technological innovation, university preparation tips, professional career profiles, at-home activities, comics, and more! 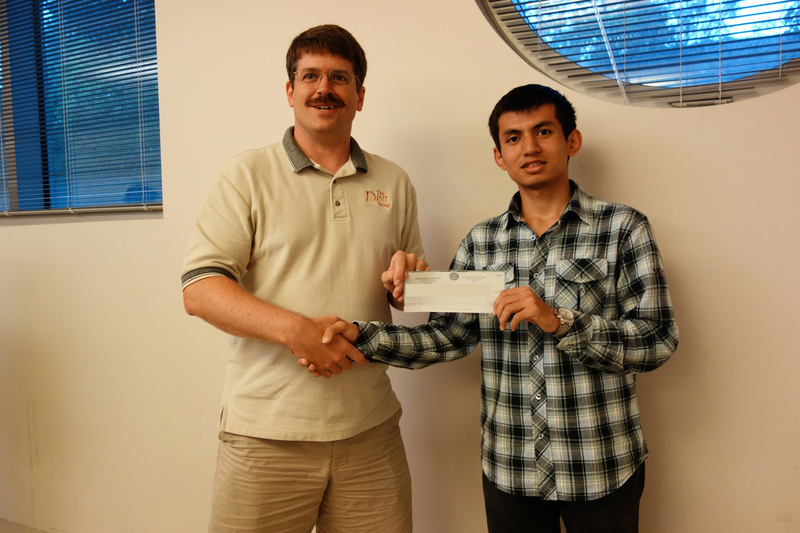 IEEE Spark is brought to you by IEEE with generous funding from the IEEE New Initiatives Committee. 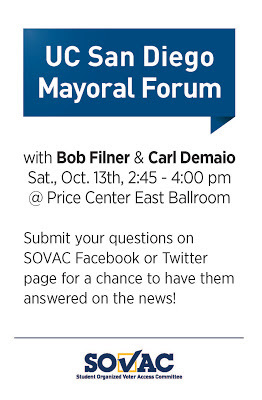 UC San Diego mayoral forum with Bob Filner & Carl Demaio. 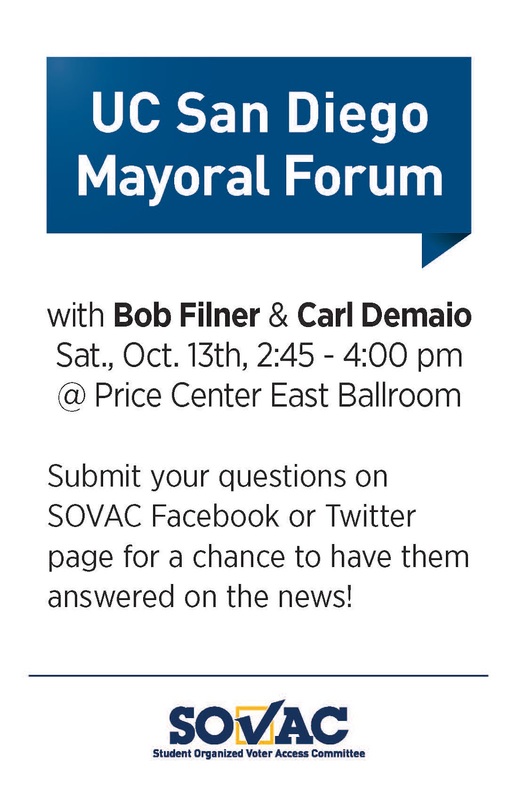 Submit questions on SOVAC Facebook or SOVAC Twitter, for a chance to have them answered on the news. SOVAC: Student Organized Voter Access Committee. Below is a link to an interesting article on the history of our bioengineering department, and some of the current, cutting-edge research happening in the bioengineering labs here at the UC San Diego Jacobs School of Engineering. Shankar Subramaniam, professor and chair of the Department of Bioengineering, wrote the article, which appeared in IEEE Pulse. 2012 Jul;3(4):49-55. The PubMed abstract is here. Not sure if a full open-access PDF will be posted on PubMed, or not. Young Jin Kim, who is affiliated with Sixth College, who was nominated for the Undergraduate Library Research Prize by Joanna McKittrick, a professor of Mechanical and Aerospace Engineering. Young Jin's research project focused on designing and building a spray pyrolysis stem to produce luminescent powders for application in solid state lighting. McKittrick first hired Kim to work in her lab after he approached her with a proposal titled "I Want to Work in Your Lab," in which he explained his fascination with materials science. That initiative clearly made him stand out, as did his research subsequently. "When Young Jin started this research, he knew nothing about solid state lighting or luminescent materials and I was impressed with his independent research into these topics," said McKittrick. "To develop this new method to synthesize particles, he needed to conduct some background research. He independently, and without my prodding, learned to use the vast library resources available to us on the campus. He has looked up papers on his research, read textbooks to understand the principles of spectroscopy and x-ray diffraction, and learned to use the JCPDS files in the library. I am truly astonished that he keyed onto the importance of using the library in this area of research; he has definitely surpassed some more senior graduate students in his research approach." In selecting Young Jin for 2nd Prize, the jury was most influenced by the fact that he employed research methods not used before in McKittrick's lab, and as a result, he was able to set up experiments based on detailed descriptions he found in journal articles; previously, experiments were based on methods already in use in the lab. This demonstrates how critical the information resources he delved into were to his actual research, at every step of the process. Is that really Jacobs Hall? The Temporal Dynamics of Learning Center, directed by computer science professor Gary Cottrell, has a quarterly newsletter that keeps the research community and the public up to date on the goings on of this NSF Science of Learning Center. The latest newsletter's "Ask the Scientist" section features computer science PhD student Jacob Whitehill. What is Optimal Teaching, and what did the recent Optimal Teaching Workshop at UC San Diego entail? The word "optimal" in "optimal teaching" is intended to underline how stochastic optimal control theory, as well as the related fields of machine learning and reinforcement learning, can contribute to the study of how humans teach as well as to the development of automated teaching systems. The past decade has seen tremendous growth in the development of inexpensive sensors such as high-resolution cameras as well as computer vision and machine learning algorithms for mapping the sensor values into meaningful information about a student's state, such as whether he/she is frustrated, bored, engaged, etc. In order to use these sensors to teach more effectively, however, it is useful to employ a principled mathematical framework such as control theory to integrate sensor inputs into the decision making process. For instance, if a student's performance drops suddenly, is it because the material was too difficult, or because the student stopped trying? If the student's face indicated that he had "disengaged" from the task, how should that sensor value affect the teacher's next action? Control theory provides a framework for using sensor inputs to both update the teacher's belief about how the student is doing, as well as to take actions to maximize the student's expected learning gains. The purpose of the Optimal Control Workshop, which the TDLC hosted on May 4 of this year, was to bring together senior researchers from the intelligent tutoring systems, neuroscience, cognitive science, machine learning, and psychology communities to discuss the state-of-the-art and current challenges to automated teaching, including but not limited to the application of stochastic optimal control theory to teaching. For more information about the Optimal Teaching Workshop, please click here. Here on the Jacobs School blog, we don't normally deviate from info specifically ABOUT the Jacobs School, but I thought this was interesting...and since the Jacobs School communications team (and many Jacobs School students, faculty and staff) are spending more and more time on social media sites, I thought this was appropriate and interesting. "In Changing News Landscape, Even Television is Vulnerable"
Chris Cox, the vice president of Product at Facebook, was in La Jolla today to talk about mapping the future of networks. In the process, he also talked about his company's vision, technology and products, including some hot-button issues, like the launch of the news feed feature. Cox was being interviewed by Alexis Madrigal, a senior editor at The Atlantic magazine, as part of a three-day event co-sponsored by UC San Diego Extension. Other guests during The Atlantic Meets the Pacific event include UC San Diego alum and genome sequencing whiz J. Craig Venter, UC San Diego neuroscientist V.S. Ramachandran, Larry Smarr, the director of Calit2, and Greg Lucier, CEO of Life Technologies. Facebook VP Cox: Products are the like button, the news feed and timeline. The product is building a container that moves around ideas.